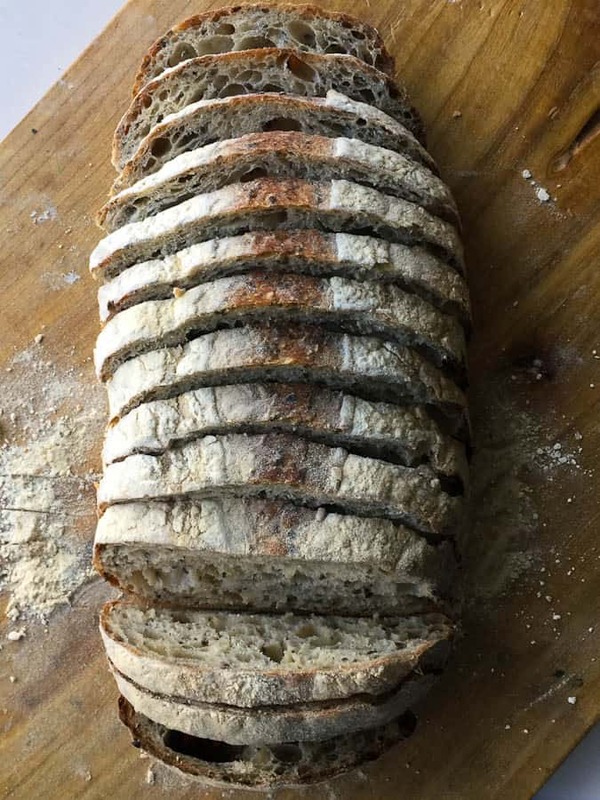 I’ve been baking sourdough bread for about 3 years now. I have been so in love with the basic recipe that it’s been hard for me to move past it. 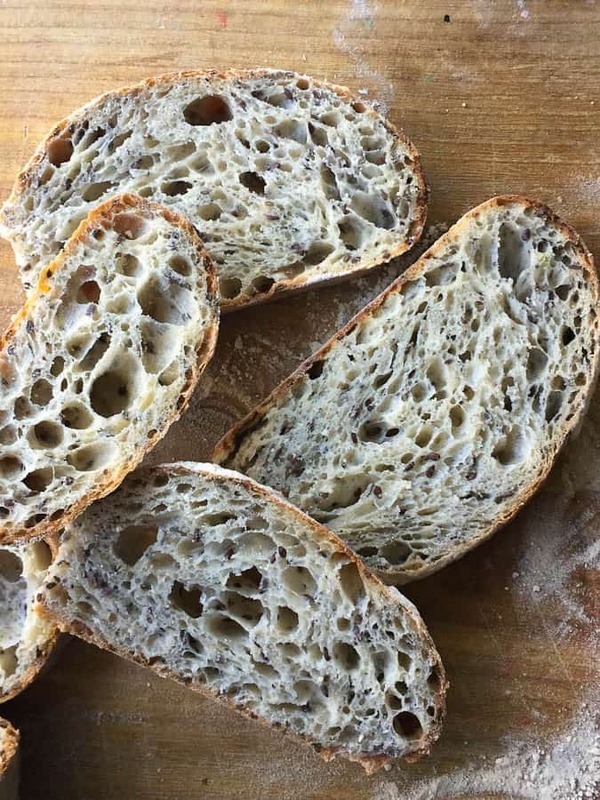 But I now found that adding chia and flax seed to your sourdough bread will add both nutrients and extra softness/tenderness to your crumb. It is, hands down, my favorite new addition to sourdough, at least for now. I’ve even learned a simple way to create a softer crust to change things up (although I usually love a crispy crust). 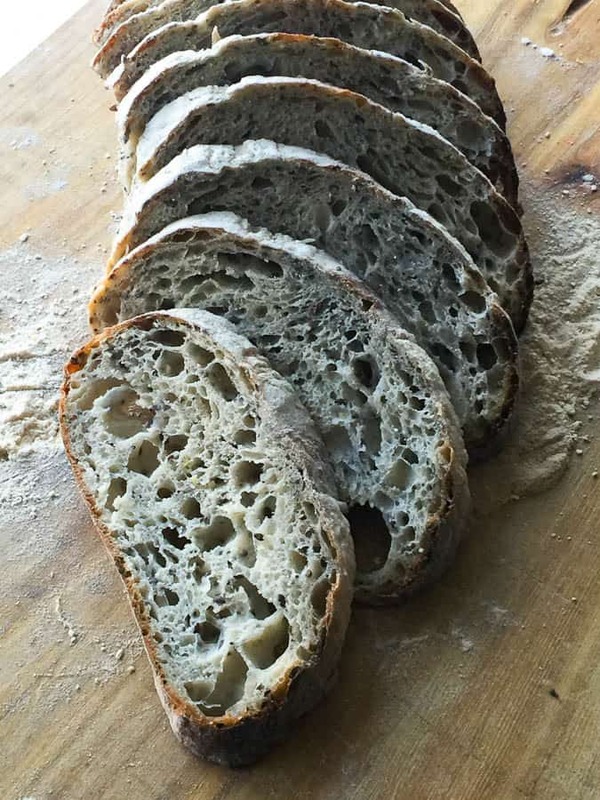 This has encouraged me to keep trying new ways of making sourdough. So this is probably not set in stone, but I add the seeds into the dough after the first turn of the dough. I believe this gives the dough a chance to develop before introducing something that would otherwise potentially hinder its development. I have had a lot of luck using this practice, although I have heard of people adding the seeds upfront during the initial mix. Before adding the seeds though, you should soak them because otherwise, the seeds will pull A LOT of moisture from your dough. Some seeds need soaking (ie, chia and flax) while others (like sunflower seeds) don’t need soaking. It all depends upon their ability to absorb water. For the past few years, I’ve been baking mostly in my Lodge combo cooker. This makes life so easy in many ways because you simply warm it up in the oven. You don’t have to worry about cracking your oven glass (if water splashes on it while you introduce steam). And you won’t get a steam burn on your arms when you introduce steam. But! ….you also are pretty much limited to making only round loaves (and unless you have 2 pots, you can only make one loaf at a time). And sooooo, I have been pushing myself to find new ways to create steam. 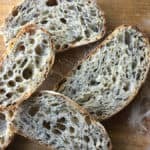 For several years, while reading The Fresh Loaf, I’ve read about various ways to create steam in your home oven. The top two seem to be using soaked rolled up towels in a pan, and pouring water over a pan of lava rocks. Recently, I came across a great blog that explains how to use both of these methods together. And, this method recommends pouring a cup of water into a preheated pan full of hot lava rocks just after loading the bread into the oven. I poured too much water (~2 cups?) plus my wet towels were not only sopping wet but there was some extra water in the bottom of the pan, so the result was awesome oven spring, but a soft crust – which can be good or bad depending on your bread goals. I’ll take it (but not always)! Now I should say that I’ve used that method before without getting a soft crust, so you have to experiment a bit with how much water/steam will begin to soften your crust if that’s your goal (or errr, just follow his directions more carefully than i did!). I usually go through a loaf of bread within a few days. I don’t keep it in plastic because I find that that ruins the crust, but if I want to freeze bread, I will slice up the entire loaf, place it in plastic and then freeze it. This flax and chia sourdough bread should keep well in the freezer for about 30 days or so. Otherwise, I simply will store the loaf, cut-side down, on a wooden cutting board. Depending on how vigorous your starter is, it should be ready within 4 to 8 hours. Add 200 to 250 g of the risen levain to a large bowl or deep container along with 700 grams of water. Mix and then add the flours. Before doing the second set of stretch and folds, add the seeds. if the edge of the dough has flattened after 20 minutes, the dough didn't proof enough - you may preshape again with the goal of strengthening the gluten. Very fond of this recipe. First time made 2 very large loaves. Second time worked well as 3 loaves–two were 8-inch, the other larger. Lately have been using Cold Oven method with cold Dutch oven. 475-500 degrees for 35-40 minutes, reduced to 375 for another 10 minutes, Great crust, delicious bread. Challenge is distribution of chia/flax seeds throughout loaves rather that periodic clumps. Does your bakers % of 87% water include the water in the chia/ flax mix? And what is the 750g + 50 water in the dough? Later on you say to use 700 water and to add 50 with the salt……. You really need to check thru all your figures. The recipe summary has totally different flour quantities than what appears on the detailed page. It’s big guess work trying to figure out what you mean. I didn’t write it down from last time I did it. Your ingredients list states 320g water for seed mix but 180g in instructions. Which is it? I’m in middle of making this so it’s a pity that I’m unsure what you mean…. oh no! I’m so sorry, it is the higher of the amounts – how did it turn out? I don’t believe it would make a huge difference, it would lower the hydration a bit. Let me know…and I’ll correct it thank you!! Glad to hear it Joy..one of the things I love about that bread is that it stays soft for days. Makes me think I need to bake a loaf of it soon!